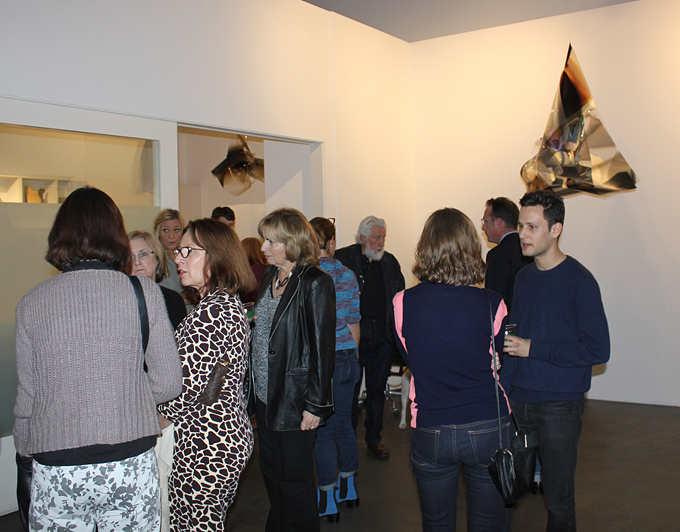 We had our opening reception for Los Gigantes at the gallery last Saturday, January 18th, and it was a great time. As you might expect, a show featuring the work of Larry Bell, Craig Kauffman, John Mason, Ed Moses and Peter Voulkos draws a big crowd. These artists are giants within the history of West Coast art, and their work attracts writers, other artists, museum and gallery professionals, and lots of fans! We were lucky enough to have Larry Bell, John Mason, and Ed Moses in attendance. In the week leading up to the reception, we fielded phone calls from excited visitors who wanted to know if they would have the chance to meet the artists, and I’m glad we didn’t disappoint them. The reception had the feel of a reunion, as Bell, Mason and Moses have known each other for many years, and they have a large circle of mutual friends. It was great to see so many members of the Los Angeles art world turn out to support these artists, who each have such strong histories in the city. With a group like this, it was no surprise that visitors wanted to linger, spending time with both the artworks and the artists. It was a great opportunity to hear from the artists directly, in a relaxed atmosphere. 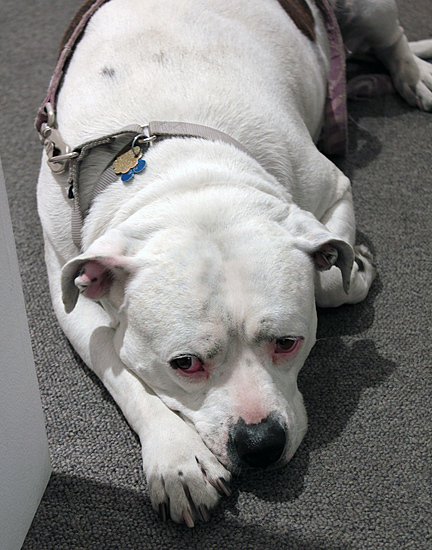 In the end, we knew it was time to head home after a long night when Pinky, Larry Bell’s dog and constant companion, curled up and took a nap in the gallery. It’s always gratifying to learn that an artist is receiving deserved recognition. Especially when the work has been a key part of the history of American ceramic sculpture. This year, John Mason will be appearing in the Whitney Biennial, curated by Stuart Comer, Anthony Elms, and Michelle Grabner, on view March 7 – May 25, 2014. Of course, this isn’t Mason’s first time at the Whitney Museum of American Art, where Mason has a fifty year record of shows. 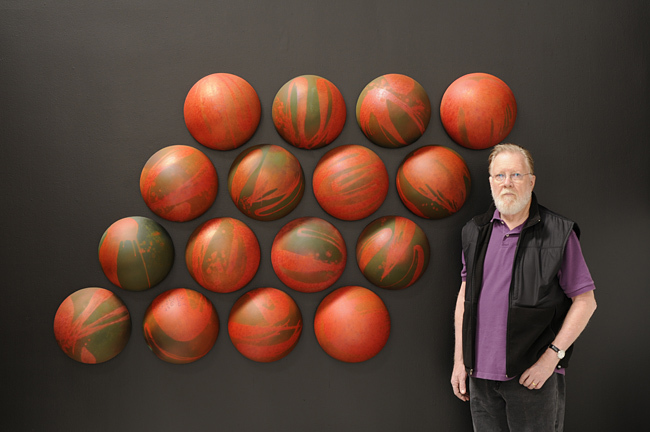 His work has been included in exhibitions such as Fifty California Artists, 1962; the 1964 Annual Exhibition: Contemporary American Sculpture; the 1973 Biennial Exhibition: Contemporary American Art; 200 Years of American Sculpture, 1976; and Ceramic Sculpture, Six Artists, 1981. The Frank Lloyd Gallery has a long history with Mason – we had the honor of representing him for sixteen years, and exhibited his work in nine solo shows. Mason was a key part of the gallery’s primary mission to re-contextualize the achievements of the major figures of West Coast Art. In addition to that recorded history, we also worked to place Mason’s work in major museum collections and private art foundations. 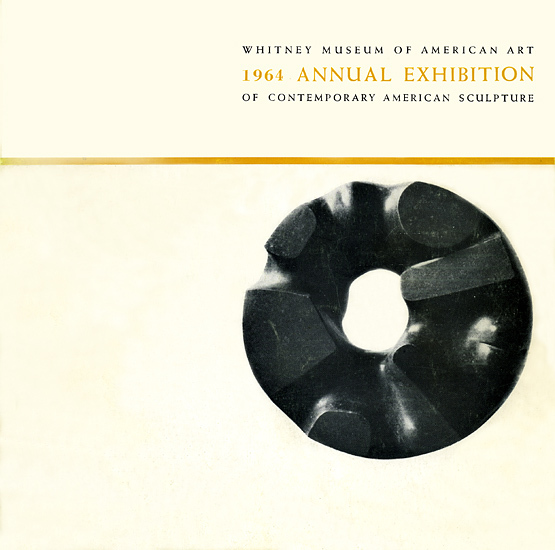 Looking back, we facilitated the placement of fifteen artworks in seven institutions, including the Maxine and Stuart Frankel Foundation for Art, the Los Angeles County Museum of Art, the Kaneko Foundation, the Anderson Collection, the Boston Museum of Fine Arts, the Buck Collection, and the Philadelphia Museum of Art. Some of these works, such as the Untitled Wall Relief, 1960, donated by W.D. Fletcher to LACMA in 2007, are on display now! Taking a look around at Los Gigantes today got me thinking about the artists and their histories with the gallery. 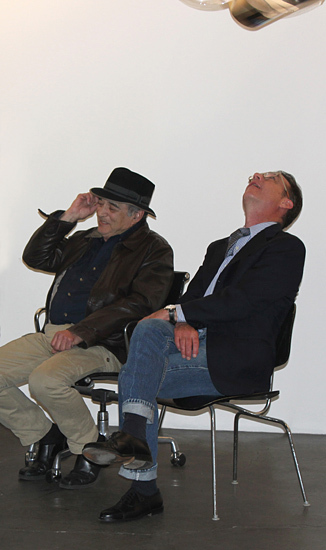 Larry Bell, Craig Kauffman, John Mason, Ed Moses, and Peter Voulkos have all exhibited here numerous times and most of them even have a gallery publication to their name! I’m always happy to produce catalogues for artists, and to support their work with scholarship that provides important context for visitors. Right now, we have four gallery-produced publications available, as well as one collaborative effort. These include exhibition catalogues for John Mason from 2000, Craig Kauffman from 2008, and Peter Voulkos from 2012. Of course, we also have Sensual Mechanical: The Art of Craig Kauffman, the definitive monograph on Kauffman’s life and work. To round things out, I also contributed an essay to the catalogue for the Ruth Chandler Williamson Gallery’s 2012 exhibition Clay’s Tectonic Shift, which I co-curated with Mary MacNaughton and Kirk Delman. Looking back through the gallery’s exhibition history, I am struck by how many shows have been organized around formal themes. Group shows including artists working with different materials have the potential to help viewers make connections between works that they might not have noticed otherwise. These kinds of shows can add context to individual artist’s works, and illustrate how related ideas have been explored by other artists. 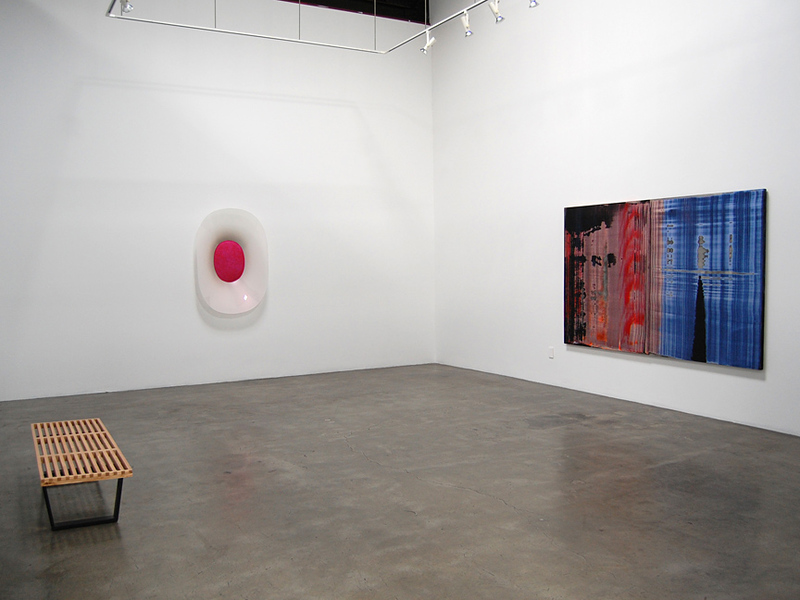 Black and White, from 2007, was a group exhibition of paintings and ceramic sculpture. Working within a limited color palette, the artists emphasized composition and form. This led to the creation of bold, dramatic, and spare artworks that related strongly to each other. 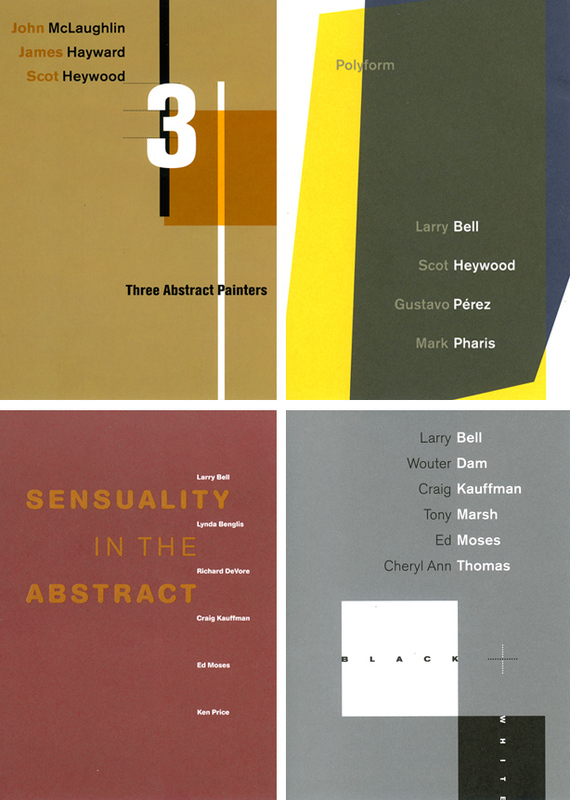 Sensuality in the Abstract, also from 2007, included the work of three painters and three sculptors. Lacking a figurative focus, the paintings alluded to eroticism and sexuality through sumptuous color relationships and suggestive forms. The sculptors addressed sensuality in a similar manner, through rich surfaces and evocative shapes. 3 Abstract Painters, from 2011, focused on the planes and surfaces of geometric abstraction in the work of John McLaughlin, James Hayward, and Scot Heywood. Featuring the work of McLaughlin alongside two contemporary painters, the show demonstrated part of the evolution of abstract painting in Southern California. Recently, the gallery presented Polyform (2013), a group show of four artists that placed contemporary ceramic sculpture alongside painting. This show illustrated the shared principles of sequencing, spatial and geometric relationships, and repetition. Consisting of multiple elements or engaging with the concept of multiplicity, the works heightened viewers’ awareness of the space they occupy. In recent years, a tremendous interest has developed in Los Angeles artists and the growth of L.A. art institutions. The success of programs at the Hammer Museum and at LACMA are examples of that surge. While some news may have focused on the ups and downs of museum funding and staff changes, there’s one fact that that bears repeating over and over: the shows coming out of Los Angeles have been superb! Today I was reminded of how the efforts of curators at both L.A. museums and local galleries have been nationally recognized. In 2013, the International Association of Art Critics included an impressive number of L.A. curators and organizations in their annual awards. Headquartered in New York, AICA-USA’s membership comprises over 400 critics, curators, scholars, and art historians working throughout the United States. 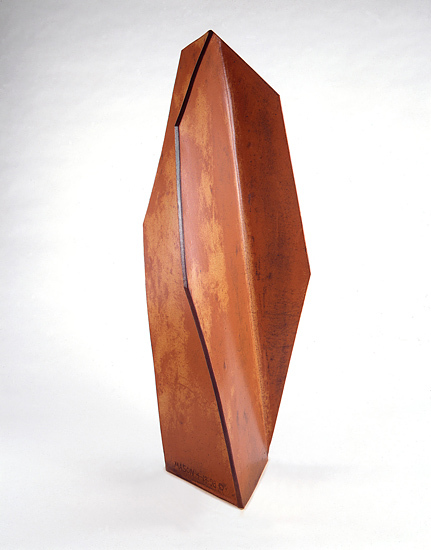 Take a look at some of the awards given out last year: to Stephanie Barron for “Ken Price Sculpture: A Retrospective,” Los Angeles County Museum of Art; to Wendy Kaplan and Bobbye Tigerman for “California Design, 1930–1965: “Living in a Modern Way,” also at the Los Angeles County Museum of Art; and to Kellie Jones, curator of “Now Dig This! Art and Black Los Angeles 1960-1980,” which opened at the Hammer Museum and traveled to MoMA PS1, New York. Paul Schimmel’s brilliant final show at MOCA, “Destroy the Picture: Painting the Void, 1949-1962,” was given an award as one of the two best thematic museum shows nationally, along with the Hammer’s “Now Dig This”. This morning I went to Cherry and Martin gallery, which was honored last year for their exhibit “Photography Into Sculpture / The Evolving Photographic Object.” Based on an exhibition at the Museum of Modern Art from 1970, organized by Peter Bunnell, the Cherry and Martin show was favored by critics as part of the Pacific Standard Time series of events. Tomorrow I will return for another view of “Face to Face: Flanders, Florence, and Renaissance Painting,” the world-class exhibit at the Huntington. It’s the work of Catherine Hess, a scholar and curator at the Huntington, who has managed to put together one of the most perfect exhibits I’ve ever seen. It’s an art history lesson for all viewers, and the selection of examples are borrowed from the Uffizzi, the National Gallery, the Boston Museum of Fine Arts, and numerous museums in Europe and America. It’s another example of why L.A. deserves recognition: the excellence of the curators. 2014 is going to be a busy year for Adrian Saxe! To begin, Saxe’s artwork will be featured in the 70th Scripps Ceramic Annual, opening on January 25th at the Ruth Chandler Williamson Gallery. The Ceramics Annual is the longest-running exhibition of contemporary ceramics in the United States, and this year it presents works by artist curators who have previously participated. The Annual has historically been organized by artists, and this year’s theme honors their contributions. The show will be on display from January 25th – April 6th, 2014. Saxe will also participate in a panel discussion including Wendell Castle and Janet Koplos at the Museum of Fine Arts Houston on February 22nd, for the opening of Beyond Craft: Decorative Arts from the Leatrice S. and Melvin B. Eagle Collection. The Eagles gifted their collection to the MFAH in 2010, and this exhibition is the first to draw extensively from it. It will remain on view through May 26th, 2014. 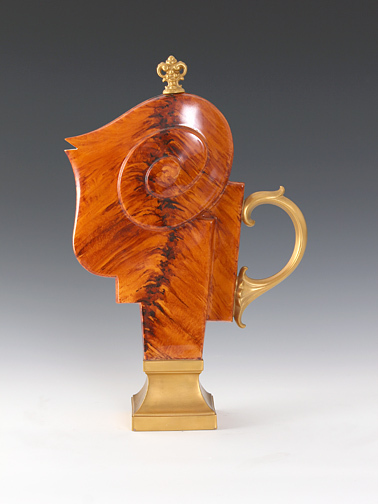 Finally, Adrian Saxe will be honored as a Regis Master for 2014 at the Northern Clay Center in Minneapolis, Minnesota. The Regis Masters Series honors senior artists who have had a major impact on the development of 20th and 21st century ceramics. Since the early 1980’s, Saxe has sought to reinvent, and bring up-to-date, a role for ceramic art that employs decorative art conventions to mirror, comment upon, and redirect social and cultural expectations. Furthermore, his longstanding position as Professor of Ceramics at the University of California, Los Angeles has allowed him to foster the development of countless ceramics students. When visitors walk into the gallery’s current show, Small is Beautiful, they are immediately greeted by an exquisite display of mortar bowls by Adrian Saxe. This series, dating to the 1980s, was based on the utilitarian mortar and pestle form, although the artist quickly eliminated the pestle. The works function primarily as a dialogue between base and vessel, furthering Saxe’s exploration of traditional modes of presentation. The stands that Lynn referred to immediately declare the preciousness of the objects they support. 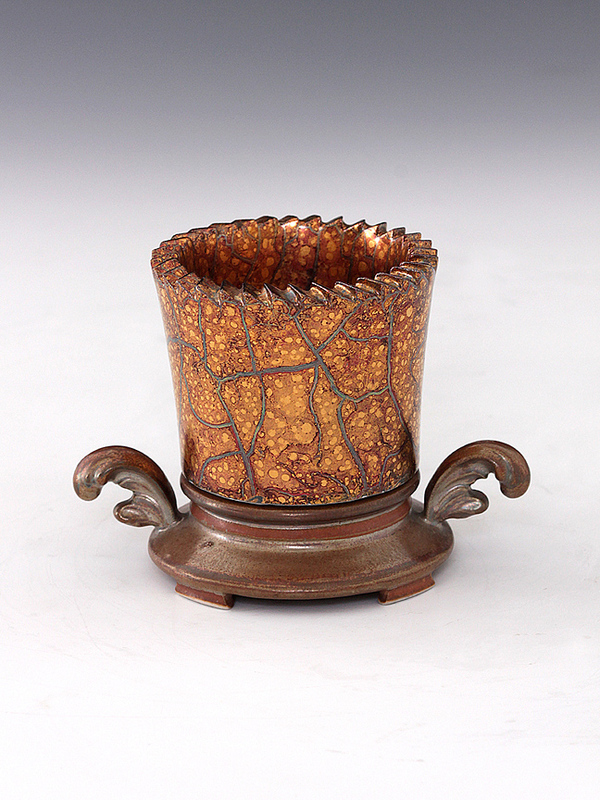 Chinese court porcelains were often similarly presented, on elaborately carved bases that enhanced the prestige of their ceramic vessels. However, instead of displaying a traditionally styled vessel, Saxe produced beakers with hand-cut gear edges and highly lustrous surfaces. By presenting his untraditional vessels in a historical mode, Saxe subverts the viewer’s expectations. Saxe pushed the juxtaposition between base and vessel further in the rounded bowl format of the same series. Jim Collins characterized these works as “beautifully rendered clay vessels positioned on raku or stoneware bases that resemble molten lava or rough-cut stone.”2 These vessels feature the same serrated edges as the beakers, and make contact with their bases through a delicately balanced touch point. The contrast of material and style between the vessel and the base is mediated through this juncture. The traditional relationship between base and vessel is also challenged in these works, as the base gains a prominence not usually associated with its format. Collins described this process, writing that “As Saxe varies the relative size, shape, and material of the base vis-à-vis the vessel, the function of the former necessarily changes as it is transformed from an unobtrusive, relatively transparent support to an explicitly forefronted device that presents the latter.”3 The base, rather than functioning as an anonymous system of support, gains its own powerful identity. 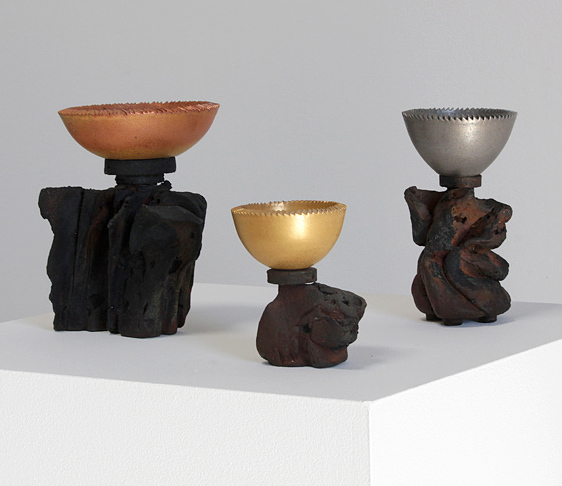 Saxe’s culturally pluralistic, hybrid works are defined by their “odd, aggressive combinations that challenge the sanctity of any and all aesthetic categories.”4 Vessels and bases are brought into opposition, and their traditional relationships subverted, in order to undermine the viewer’s expectations. The mortar bowl series represents an amalgamation of styles in which the component pieces maintain their distinct identities, creating layered works of technical and cultural complexity. 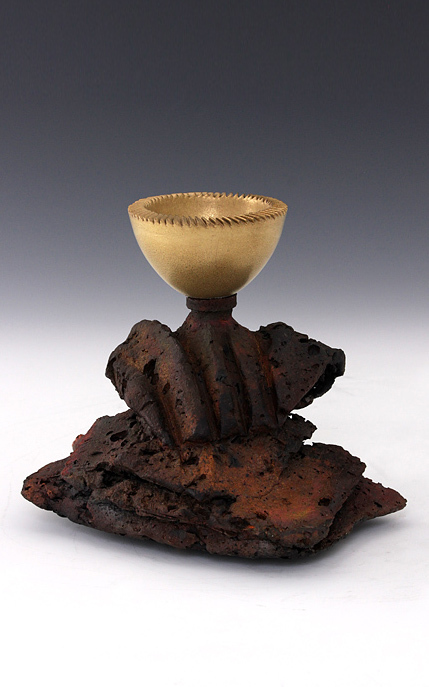 1 Lynn, Martha Drexler, “Adrian Saxe and the Cultured Pot,” in The Clay Art of Adrian Saxe. (Los Angeles: Thames and Hudson and the Los Angeles County Museum of Art, 1993) 31. 2 Collins, Jim, “Adrian Saxe and the Postmodern Vessel,” in The Clay Art of Adrian Saxe. (Los Angeles: Thames and Hudson and the Los Angeles County Museum of Art, 1993) 125.